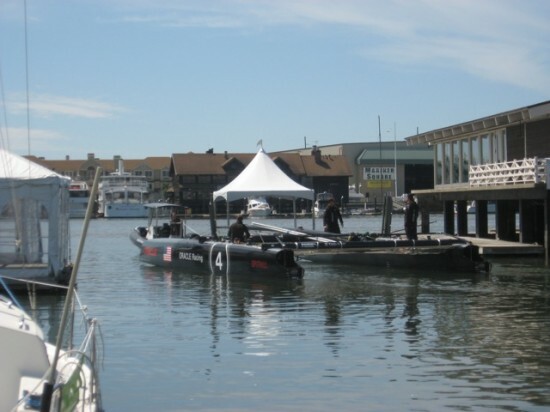 It was the day after the Boat Show at Jack London Sq. Mostly everyone had left except for slow ones like ourselves. TeamZen slowly gathered after lunch to go out on the S.F. Bay for a photo op. 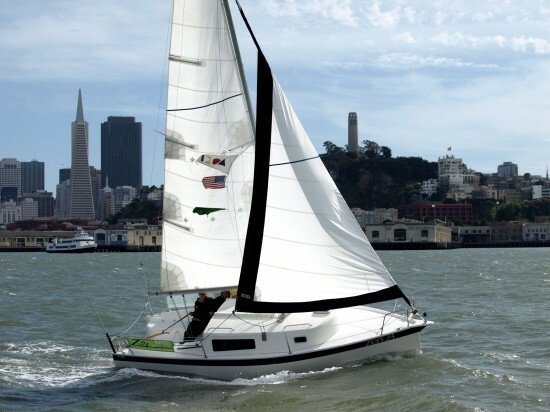 We wanted some shots of the Zen 24 out by the Golden Gate Bridge where there are usually some serious winds. 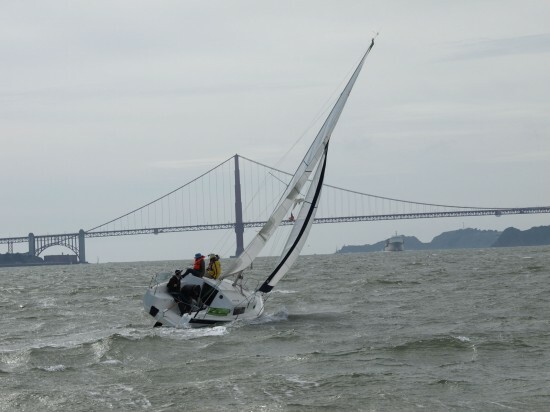 There had been a few comments about if the ZenBoat being so light weight could handle the conditions out by Golden Gate bridge call the “slot”. Avg wind there is about 25kts with gust of 30-40 kt’s. We had a slow start getting out of the Estuary. We were to meet up with our newest sales Assoc Captain Mary. She would using a CAT as a camera boat following us out on the bay. The five of us slowly made our way, tacking many times on the narrow trip up the Estuary. We all met up while we were almost out into the bay. 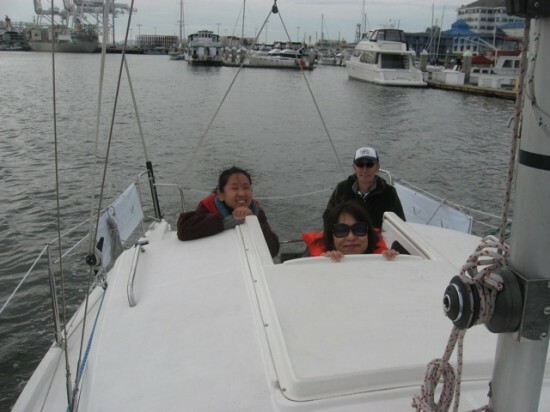 Once there we motored over to the Bay Bridge then set all sails. The wind pickup to 20-25 kt’s once we hit the bay proper. We all held on. Sensei only pulled in the roller jib to 100% from 120% and left the main at full. As we were heading into the wind on a close haul, it was a rough ride. In the Zen philosophy one practices Zen to be the calm in the storms of life, for life is not always smooth sailing. This was that active practice live. 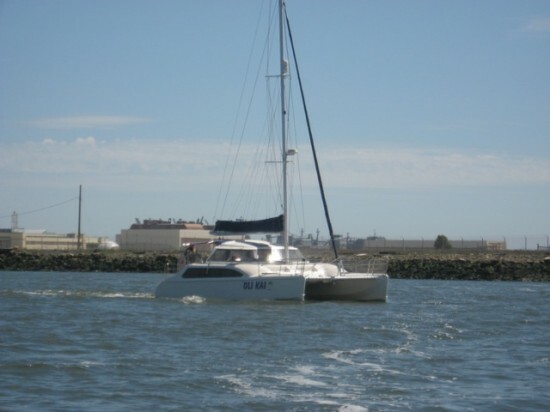 The photos in the past showed how easy it is to sail the Zen24 under gentle conditions. The pictures from the Bay show the Zen24 can also remain a centered pleasure craft under challenging conditions. Zen24 is a light weight boat but not light on performance . Myself and the two ladies rode on the weather side while Sensei and his friend, another Ocean crosser, handled the cockpit. With every tack we on the weather side ducked and held on while we slide to the other side of the cabin top. Once we almost lost one of the ladies as she could not get a grip during tack. I grabbed her arm in time to stop her from sliding off the cabin into the cold water. 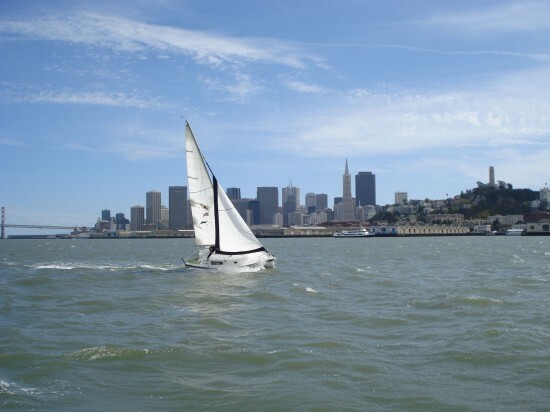 The was plenty of chop as we sailed along but for the most part we stayed dry zipping along the San Francisco water front at about 6 knts. Finally we got enough shots and turned back for home port. The ride back was very quick as we headed down wind. I think everyone was ready to ready to call it a day. P1, Speed of the boat. Some sailors might say, “I’m not interested much in boat speed.” However, properties 2, 3 and 4 depend on property 1. Naval architects try to design boats to sail as fast as possible, because they are aware of this fact. Potential boat speed is like money in your pocket. You have to give up many things if your budget is not very big. Boat speed is a function of 1. Sail area/Stability, 2. Displacement/Water line length and 3. hull form. Naval architects always try to establish a balance between those factors. The hull form is designed to have the least wave making hull section as the boat moves through the water, because wave making resistance accounts for 95% of the drag on the boat going through the water. Also to consider is that if your boat is heavier you need more sail area. This requires heavier spars, rigging and other gear which makes the boat heavier and starts a vicious cycle that slows down the boat. P2, Ease of steering. If you don’t have enough speed, it will be difficult to control and steer the boat. This is because the rudder does not work as well under slow speed. The rudder will lose 19% efficiency when there is a decrease of 10% in speed. When a boat is travelling slowly, the helmsman will have to work harder physically and mentally. Imagine that you are short handed or with family and the conditions are bad. You will need to be able to maintain control in these conditions. Another reason that you need ease of of steering is to reduce weather helm even when the boat is heeling. 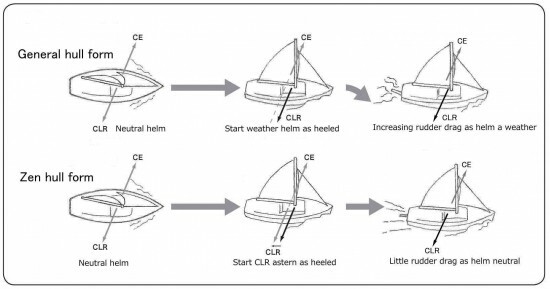 When the center of lateral resistance (CLR) is balanced with the center of effort (CE) the boat’s helm is balanced. Many boats can not maintain a balanced helm when heeled but the Zen 24’s hull form creates hydrodynamic lift which can offset weather helm. P3, Degree of comfort. Comfort under way is another important property for boats and her skippers. This property goes hand in hand with the previous two. Comfort is partly a function of ease of steering and boat motion. If the boat has a gentle motion, the crew can steer without too much effort. Since the crew is not struggling to steer the boat, they can enjoy the ride and cruise in comfort. P4, Seaworthiness. Is a typical traditional boat that has a heavy displacement and a wine glass hull section more seaworthy than a modern light weight fiber glass boat? Not necessarily. The Volvo Ocean racing boats, as well as traditional designed boats have been sailing around the world and in places as treacherous as Cape Horn. 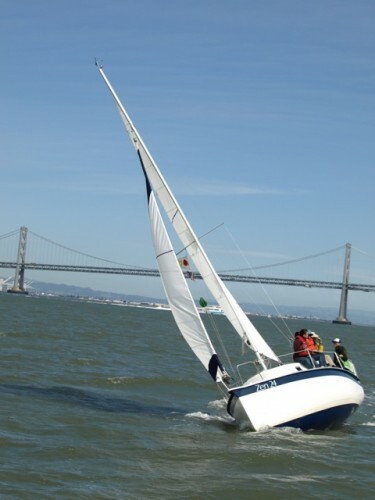 Racing boats sometimes lose spars, keels or are capsized. These problems are usually because of engineering factors. Traditional boats also encounter the same problems. “Tzu-Han” a 50 foot traditional design boat even lost her deck after recovering from capsize in the Southern Ocean. Traditional design boats often have to heave to under heavy condtions, because they will be out of control due to lack of speed and thereby also lacking steering control. They also get submerged in big waves because of their limited reserve buoyancy. The Volvo Ocean race boats also might lack properties 2 and 3 but their seaworthiness is compensated with well trained crewmembers. 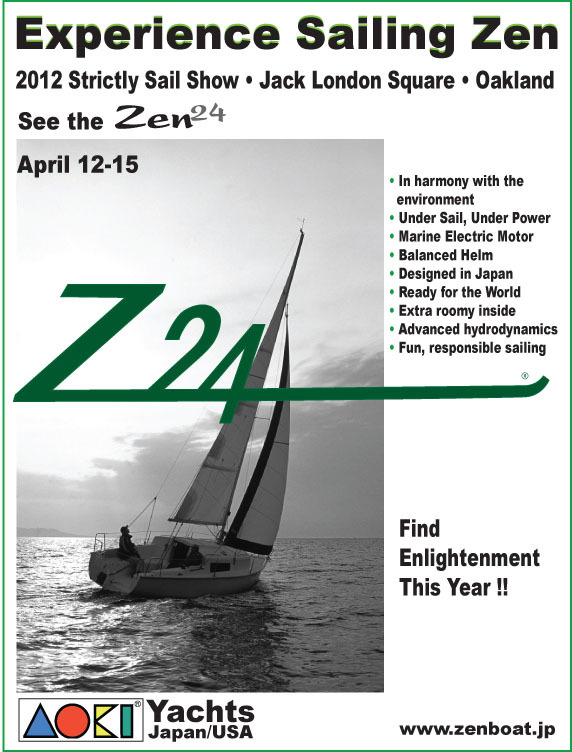 The Zen 24 has the potential to sail under the Force 10 conditions without much stress because she has been designed with all four properties in mind. 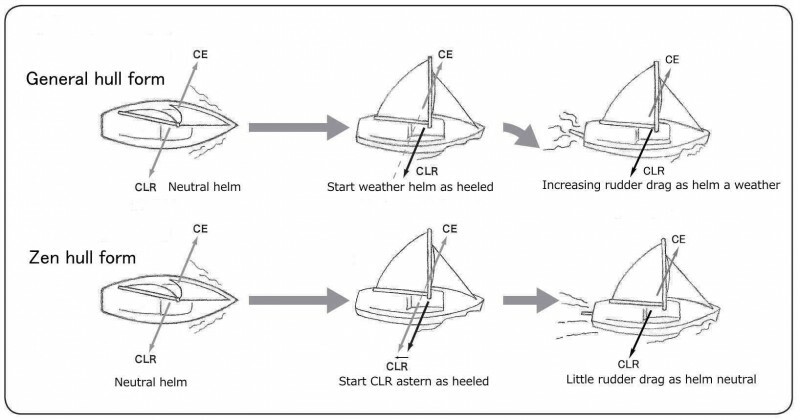 Weather helm is the term used to describe a sailboat’s tendency to head up into the weather side when the tiller is a mid-ship. Too much weather helm makes the boat difficult to handle and reduces speed. Most sailboat hull forms have not been considered in reducing the weather helm when the boat is heeled over by the wind. However, the hull of the Zen 24 has been especially designed so that weather helm is reduced and neutral helm is maintained when the boat is heeling. The hydrodynamic advantage of the Zen 24 hull form comes from the interaction between the centers of effort and lateral resistance, as the diagrams below show. Because of the unique shape of the hull, the Zen 24 is able to maintain a balanced and neutral helm, even when heeled by the wind. 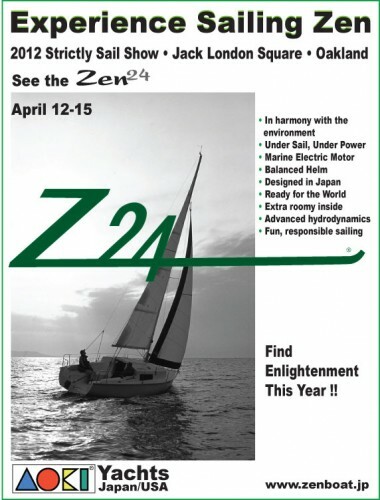 This makes the Zen 24 a very stable and comfortable sailing boat.